Preparing a job using a Printer Template or "Offline Printer"
When is an internet connection required? — An internet connection IS NOT REQUIRED to use GrabCAD Print for local printing. You will not be prompted to log in unless you disable Offline Mode in File > System Preferences > Privacy. 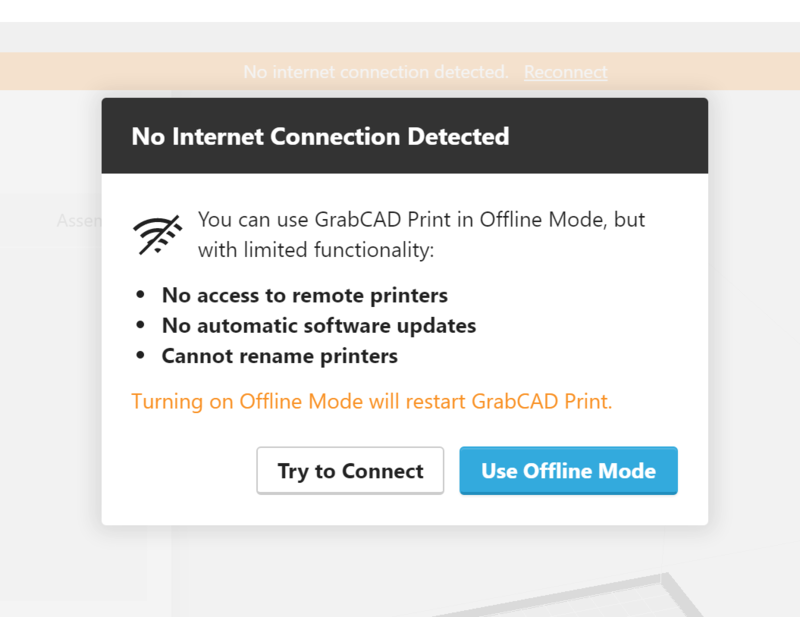 What if I have an internet connection, but I need to prevent GrabCAD Print from connecting to it? — You can force the above message to appear if you temporarily disable the internet connection while launching the app for the first time. What happens when I have logged in before, but I lose internet connectivity? — You can launch the app normally. A warning message will appear, but unless your selected printer is remote, your work will not be interrupted. Can I update my printer's firmware when in Offline Mode? — Yes, if you can manually download the update from another source, you just need to put the printer into maintenance mode and then go to the Settings screen in the Printer Panel. Read more here. How to I use Offline Mode if I am logged in normally now? — Go to File > System Preferences > Privacy. 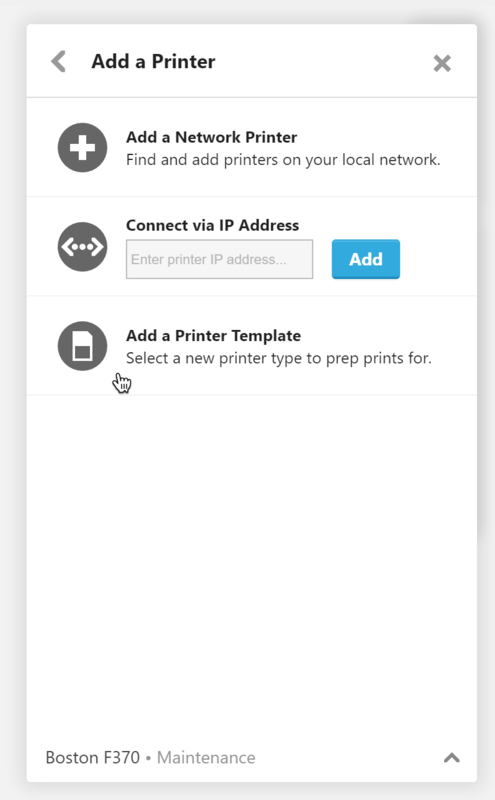 If you can't connect to the desired printer locally or using GrabCAD Print Server, you can add an "Offline Printer" which is a template of the printer type. Open the printer panel and click "Add a printer". Select "Add an Offline Printer" and then click on the printer manufacturer. Select a printer, and the tray will update to the appropriate size. This printer will remain in your My Printers list. In order to remove this printer, right click and select "Forget this printer." The best way to transfer a print job from one computer to another is to save the GrabCAD Print Project, creating a .PRINT file. This contains all of the 3D models, as well as all of the print settings for all of the trays. For FDM systems, you can also export a .CMB file. This works well for doing further modifications on the print in Insight, as well as manually adding the job to the printer queue via a USB drive. Arrange your tray and adjust material settings as desired. Go to File > "Export as..." or press ctrl + shift + E.
This will save the CMB file in the directory you choose.